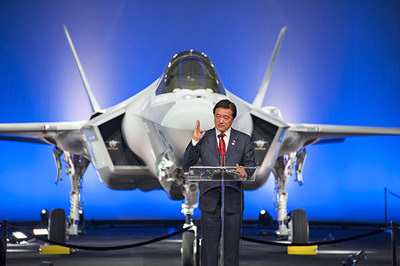 Kenji Wakamiya, Japan’s State Minister of Defense spoke at the roll out of Japan’s first F-35 in Fort Worth, Texas, Sept. 23, 2016. A Japanese air force F-35 stealth fighter crashed in the Pacific Ocean during a night training flight and parts of the jet were recovered, the defense ministry said April 10. The pilot is still missing. The F-35A stealth jet disappeared from radar while flying off the eastern coast of Aomori. Parts of the jet were found late April 9, the Air Self-Defense Force said. Under guidelines approved in December, Prime Minister Shinzo Abe’s government plans to buy 147 F-35s, including 105 F-35As, costing about 10 billion yen ($90 million) each.